Commuters are coming together in Flushing on Tuesday to demand better public transportation. It’s 2019. It’s time that Albany and Governor Cuomo work together on a funding package to fix our broken subway. 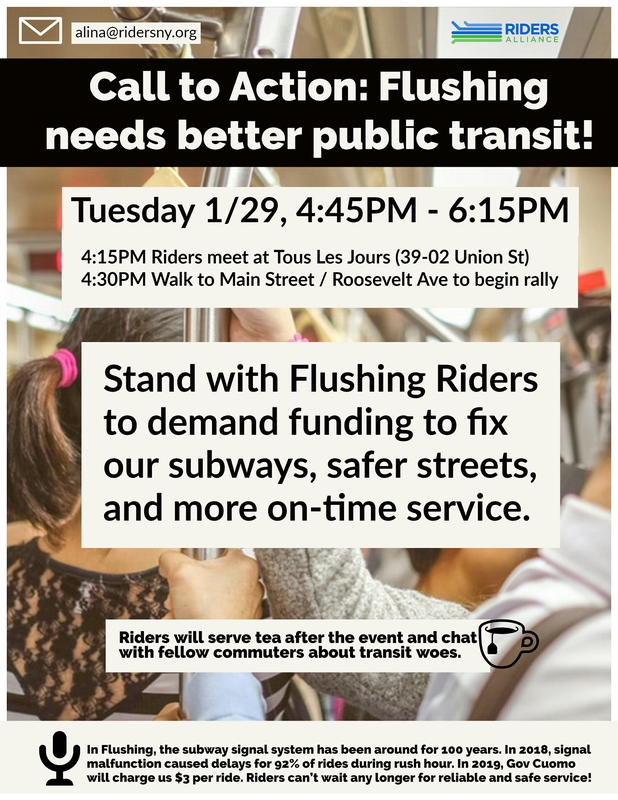 Join your neighbors and fellow riders for a Flushing for Public Transit Action. We’ll be calling on State Senators Liu and Stavisky, and State Assembly Members Kim and Rozic to support their constituents and fight for real money save our public transportation system. Riders who are able to meet earlier should convene at Tous Les Jours (39-02 Union St, Flushing). We will be there by 4:00PM and head over at 4:30PM. If you’d like to work with the Riders Alliance, join them for a campaign planning meeting. They’re organizing to hold Queens elected officials accountable to win better subway service. RSVP here.